Contains patented technology to improve choline-stabilization and provide superior absorption over other choline based products. When it comes to your thyroid most people focus only on energy and weight gain, but this doesn’t account for the serious cosmetic changes that hypothyroidism causes. Your outward appearance has a dramatic impact on your self-confidence. It’s not wrong to want to improve these cosmetic features! What kind of changes am I referring to? These changes all result from a combination of low thyroid function AND nutrient deficiency that hypothyroidism causes. The big problem is that simply taking thyroid hormone won’t necessarily replace the nutrients that your body is deficient in! This explains why so many hypothyroid patients STILL have hair loss, skin changes, and brittle nails even after taking thyroid hormone like Synthroid or Levothyroxine. This leaves hundreds of patients feeling frustrated or stuck as they try desperately to get back their beauty. Up until now, hypothyroid patients had to rely on poor quality nutrients to try and reverse these cosmetic changes. Thyroid hair regrowth complex contains patented technology which allows for superior absorption of silicon and choline by binding these nutrients to orthosilicic acid. This combination has been studied and proven to be effective in placebo-controlled trials at increasing hair growth, strengthening nails and improving skin quality. By taking Thyroid Hair Regrowth Complex you are providing your body with the exact high-quality nutrients and precursors it can use to efficiently strengthen your hair, skin, and nails. So what does thyroid hair regrowth complex do? It provides your body with the critical nutrient precursors to collagen, elastin, and keratin – collectively known as the beauty proteins in your body. That means it will help accelerate the growth of hair follicles, promote strength in your hair/nails and restore your skin to its natural state. Why is it important to increase collagen, elastin, and keratin? We already know that hypothyroid patients have ACCELERATED LOSS of these proteins due to low thyroid function at the cellular level. So that’s a really good reason to increase collagen production by itself. Starting at around age 35 your collagen naturally starts to fade and reduce. This effect is compounded if you also have hypothyroidism which means that collagen loss will be accelerated even further. This is why so many women start to notice wrinkles, skin changes, hair changes and the signs of “aging” around this age. The important thing to realize is that you can SLOW DOWN this process if you take the right steps (sorry, we don’t know how to stop it!). #1. Take supplements that promote collagen, keratin and elastin growth and acceleration. #2. Stop doing things that INCREASE collagen loss and degradation. The two most important things that thyroid patients need to do is get started on thyroid hormone AND take supplements to halt collagen loss. But why is collagen so important? Collagen, elastin, and keratin form the FRAMEWORK of your hair, skin and nail cells which provides them with structural integrity. Imagine building a tree-house with flimsy wood instead of strong sturdy wood. It might look like a tree house but it starts to sag, bend and even break. This exact same concept is occurring but in your hair, skin and nail cells. The lack of structural integrity results in weak nails that bend and break. It causes your hair follicles to bend, break and even fall out. And it causes your skin to become heavy, sag and form wrinkles. You can FIGHT these changes by providing your body with the precursors to collagen, elastin, and keratin. All of these precursors are included in thyroid hair regrowth complex which has been designed to specifically fight this problem. Taking thyroid hair regrowth complex will help you regain your hair, skin, and nails – all of which have been robbed by your thyroid. Beyond the effects on hair, skin, and nails – Thyroid Hair Regrowth Complex will also help strengthen your bones and improve both strength and flexibility in your joints. What makes Thyroid Hair Regrowth Complex Different? So how is thyroid hair regrowth complex different from your run of the mill hair/skin/nails supplement? I probably don’t have to tell you (but I will anyway) about the importance not only of taking the RIGHT nutrients but allowing for those nutrients to be absorbed properly. It doesn’t matter if you take the RIGHT supplements if none of them are getting absorbed in your GI tract, right? Hypothyroidism results in low stomach acid which REDUCES the absorption of critical nutrients in the small intestines. Because of this interaction hypothyroid patients need to take extreme care when choosing supplements. Thyroid hair regrowth complex cuts out this problem by binding choline and silica to a special compound known as orthosilicic acid. Orthosilicic acid helps dramatically INCREASE the absorption of both of these nutrients and actually ALLOWS them to enter your body through your intestinal tract. It also “stabilizes” and protects these nutrients from bacteria and acidic pH in the intestinal tract ensuring that they are delivered to the right place. And, by the way, this compound has indeed been proven to work clinically in several studies (you can find all relevant studies at the bottom of this post). For best results, you will want to use 2 capsules each day (1 in the morning and 1 in the evening). You should notice an improvement in your hair, skin, and nails within a few weeks of use and this effect will continue to improve over 6-8 months of daily use. What if I don’t have a Thyroid Problem? The ingredients in this supplement are designed to help whether or not you have a thyroid problem and they should, therefore, help you if you have other issues that aren’t related to your thyroid. Many patients are deficient in the combination of choline (found most common in particular food sources) and silica which is why this combination is so effective. This potent combination of nutrients helps improve the quality and texture of your hair, skin, and nails by enabling protein and elastin synthesis. In addition to taking thyroid hair regrowth complex as described above, you can also go above and beyond to help boost your results. #1. Drink at least 64 ounces of filtered water each and every day and up to 128 ounces (1 gallon) if you are active. Hydration will help increase skin turgor and promote elimination of harmful chemicals/toxins that can bind to your supplements and deactivate collagen. #2. Take supplements to increase free T3 levels and promote thyroid conversion. You can increase the effectiveness of your existing thyroid medication (which may help you reduce your total dose) by taking supplements designed to increase T4 to T3 conversion. You can do that by using my Thyroid Adrenal Reset Complex or my T3 Conversion Booster formulations. #3. Avoid GMO and non-organic foods. Avoiding GMO and non-organic foods will reduce your exposure to toxins and endocrine disruptors that damage skin and accelerate the aging process. These hormones also bind to thyroid hormone and reduce the effectiveness of thyroid hormone. #4. Avoid excessive sun exposure. Excessive sun exposure can also accelerate the degradation of collagen and advance skin aging. If you are treating aged skin make sure to protect yourself from harmful UVA rays. #5. Check your iron levels. If you are suffering from hair loss make sure to evaluate your ferritin levels (this acts as a marker for iron stores in the body). In order to grow hair back properly, you need to have a ferritin in excess of 60. Low iron also impairs thyroid function by the way! How do you take thyroid hair regrowth complex? Thyroid hair regrowth complex should be taken with food or without food 1 capsule in the morning and 1 capsule in the evening. How quickly will I notice a change in my hair, skin, and nails? 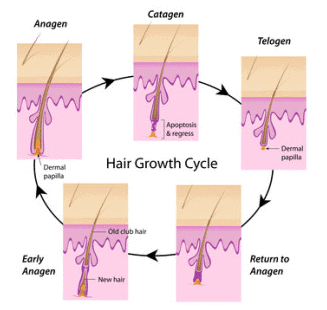 As you may be aware it can take up to several months for hair to enter its growth cycle. Some patients who use Thyroid Hair Regrowth Complex notice an improvement in the quality and texture of their hair very quickly. While this can’t be explained scientifically I suspect it has to do with the triggering of hair growth cycles with the supplement. Other patients may need to take the supplement for up to 2 months to notice full results, but many patients will notice an improvement within the first 30 days. No, thyroid hair regrowth complex is well tolerated with no reported side effects at this time (it has been used on thousands of patients). Most people will see results within 2-4 weeks, but these results continue to improve and grow over 6-8 months. In clinical studies, most patients showed the strongest improvement with 6-8 months of consistent daily use. Does this interfere with my thyroid medication? No, thyroid hair regrowth complex should not interfere directly with thyroid hormone absorption. Does this work if I don’t have thyroid problems? YES! Thyroid hair regrowth complex is NOT just for thyroid patients and it has been shown to work in both hypothyroid and non-hypothyroid patients. Is this supplement safe for vegans? Does this supplement have gluten, dairy, soy or any other ingredients? I have been taking these for about 4 weeks. I see less hair falling out. I also notice my nails growing a bit faster . I hope this will help my eyebrows! I’ve only been taking the product for about one month but I feel like my hair is getting thicker and healthier. I’m really hopeful that this is the answer to my thinning hair andwill continue using and update on the progress. After over a year of taking my thyroid medication, my hair was falling out like crazy. I started taking this product and within a few days, there was a noticeable difference in how much hair I was losing in the shower. I also noticed a decrease in how often I was having to clean my hair brush. I highly recommend this product! Hi Josephine, Glad it's working for you and thanks for sharing! The product is amazing!! My hair started to grow with in 2 weeks after using the products. Hi Donna, Awesome! Thanks for sharing!